Craft store boxes can be painted to inspire thoughts of the jolly old elf himself. Make a stack to decorate your home. 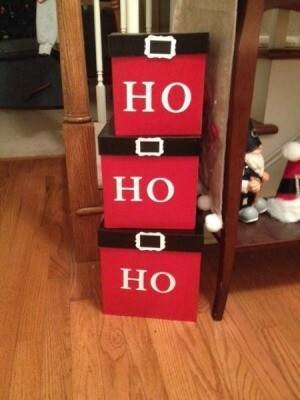 This is a guide about making "Ho Ho Ho" Santa boxes. Paper Mache boxes made to look like Santa. Spray paint the lower part of the boxes with red spray paint. Spray paint the lids with black. Cut out 3 black rectangles to place on top of belt buckles. Once the paint is dry, glue on the letters and belt buckles.